We were all expecting it. In fact, we’ve all been waiting for it ever since this year’s Google I/O. However, that conference came and went, without a trace of Android 4.3. But after last week’s Android 4.3 leak, we knew it was finally coming soon. And in today’s Google event, which also marked the release of the Nexus 7 refresh, it has finally been made official. Much has also been done to improve UI performance. Most notably, the Android 4.3 Platform Highlights page mentions a change to the hardware-accelerated 2D subsystem that modifies the stream of drawing commands to send the commands to the GPU in an optimized manner. And in instances when the CPU is required, these operations are now multi-threaded, allowing the use of multiple CPU cores. Improved window buffer allocation also speeds up buffer allocation, resulting in speedier rendering starts. And to best harness the GPU’s power in 2D hardware-accelerated tasks, the system now uses OpenGL ES 3.0 for optimized texture management and to maintain higher gradient rendering fidelity. Of course, however, the main use of OpenGL ES 3.0 will be to provide game developers with the framework and native API access they need to produce high quality and efficient games. 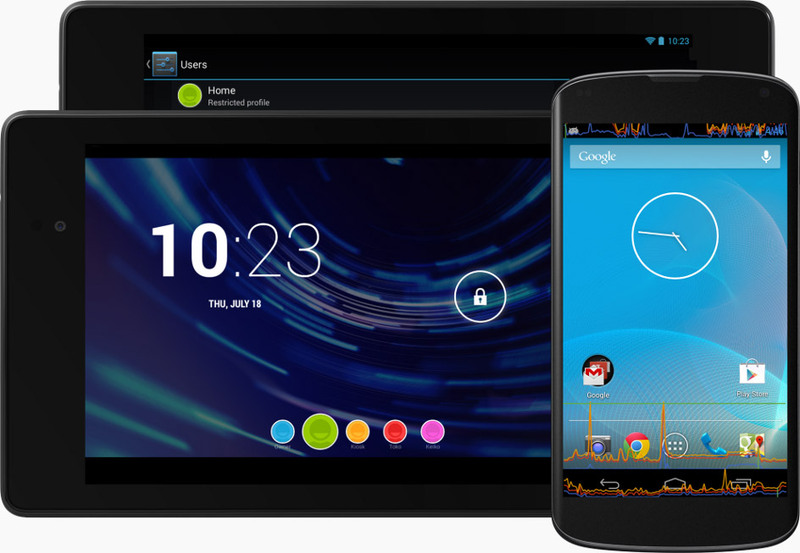 Another major highlight in this Jelly Bean refresh is a substantial refresh to the notification system, whereby third-party apps can observe the stream of notifications and display them or transfer them to nearby connected Bluetooth devices. And just as before, notifications can be enabled or disabled per app. Building upon this, however, now users are allowed to see and toggle which apps have access to the notification stream. The tablet multi-user feature has also been revamped. Now in 4.3, users are given the option to set up restricted profiles. This allows owners to easily create separate environments for each user, with the ability to manage restrictions in apps available in those environments. This feature is aimed to sharing your device with friends and use at kiosks. Other notable changes include Bluetooth Smart Ready to aid in discovery and communication with nearby devices, Bluetooth AVRCP 1.3 support for richer interactions with media streaming devices, an improved DRM framework, and a VP8 video encoder. You can learn more by heading over to the Android Developers blog post and Android 4.3 Platform Highlights page. If you’re lucky enough to own a Google Nexus 4, Nexus 7, Nexus 10, or Galaxy Nexus, you can expect this update to come over-the-air shortly. And if you find yourself impatiently waiting, you can get a head start and download the images by visiting the Nexus device factory images.